So, last week a stylist friend of mine asked me to make some hats for a photo shoot, and sent along a series of pictures to serve as examples of the chosen 'look' for the shoot. To my delight, the theme was royal portraits, and most of the pictures were from the 18th & 19th centuries. 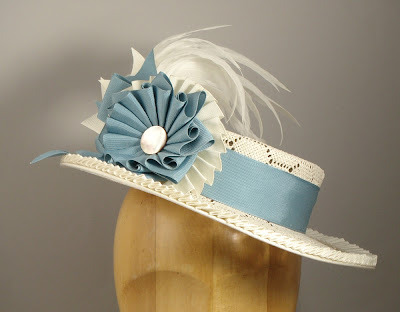 The images she chose were so inspiring to me that I felt supercharged and had a great time making several hats. One of the pictures that struck me most was this one, by the artist Thomas Gainsborough (1727–1788). 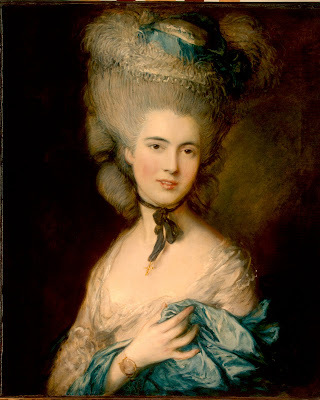 Titled "A Woman in Blue", the subject was the Duchess of Beaufort, and painted circa 1780. 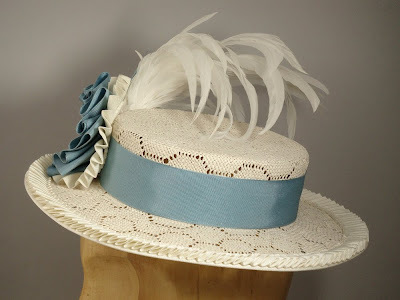 What I like about it, besides the fabulousness of her enormous hair, is the combination of the white hat, the blue ribbon band, and the curling white feathers. I don't usually go for overtly feminine styles, so it was fun to try on for size. 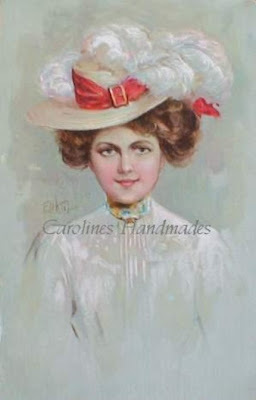 The hat itself is probably a straw, as they were very popular during that time. It reminded me of this picture, from about 125 years later, when natural colored straw with ostrich feathers were also popular. 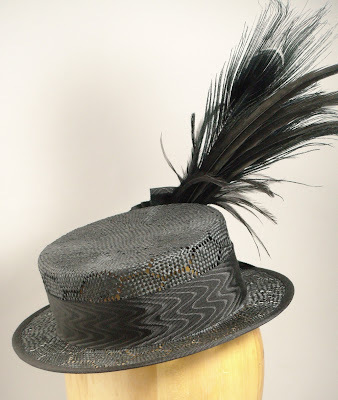 But, these hats are a bit soft looking and I wanted something with sharper edges and less fuzz. 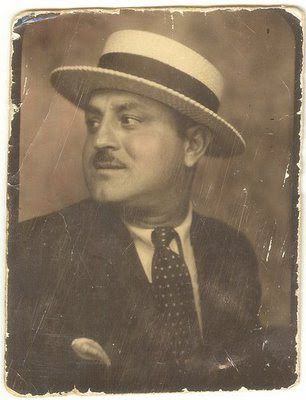 And what could be sharper, or more dapper, than a boater hat? 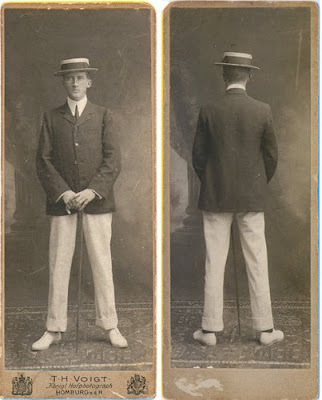 There's just nothing that says 'summer' like a boater. A gondolier, all in summer whites. 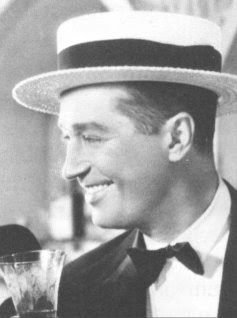 And of course, Maurice Chevalier wore his tux with a boater. Why not? He looks smashing. I'd been wanting to make boaters for a while, but their time just hadn't come yet for me. So, in a flurry of blocking and stitching, I made one each one in white and black, all in one day. Here's how they turned out. 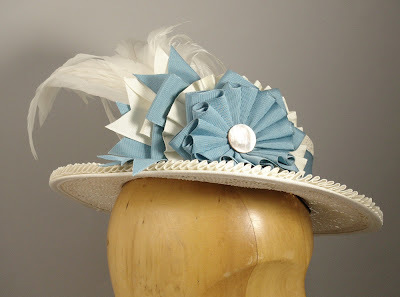 I made this one with a slightly wider brim than usual, which allowed me to give the front of the brim a slight dip. I love it! I went a bit crazy and added more tails and loops than usual to the cockade. 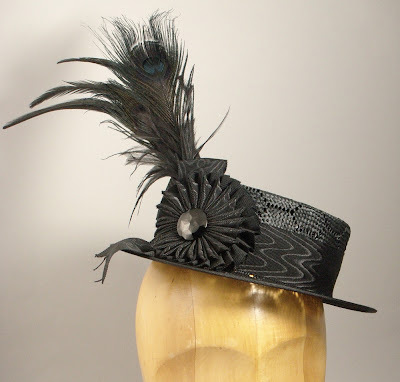 As you can see, I opted for curled coque feathers instead of the too-fussy ostrich. Boaters are often made of fairly thick straw or chip, and can sometimes look heavy. 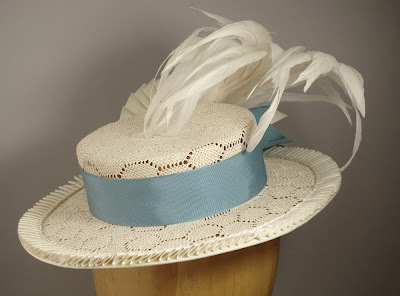 I wanted something lighter and more graceful for these hats, so instead I chose a lacy, eyelet-patterned straw. When the light shines through from above, the holes make a beautiful dappled pattern of points of light on your face. 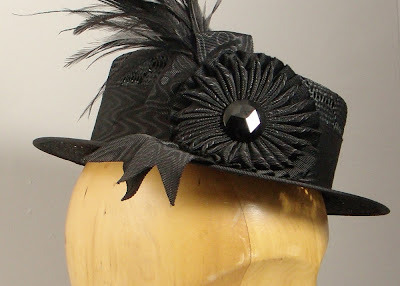 This black one has the same size crown but with a stingier brim. 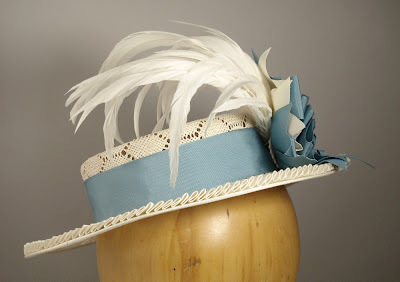 It looks boxier, but the feathers soften it up a bit. I used a combination of emu, ringtail pheasant, and peacock feathers, all dyed black. Both of these hats are available now on etsy. 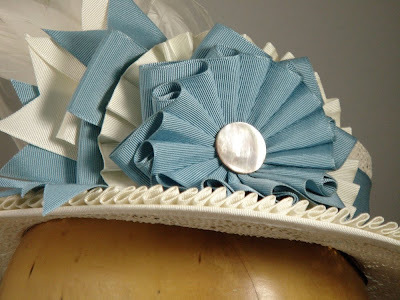 I think that, with some alteration in colors to suit the occasion, either of these would be great for bridal. I'm going to make up some all white and ivory samples soon. I once tried on a boater hat in an antique shop in Toronto. I thing it was in the early 90s. This piece had a price tag of $400.00 Canadian at the time. It was an incredible hat in that it appeared to be made of wicker and the weave was of byzantine complexity. I don't know if it was its age that made it the 'brown sugar' color it had. I couldn't buy it. Anyway, I love your hats! I would appreciate your input on what it was that I was trying on and if you know how, can you make one for me?